I’ve been hooked on Fantasy for about a year and a half now, and the closest I’ve come to enjoying a series as much as George RR Martin’s A Song Of Ice And Fire is by reading the trilogy I’ve just finished. 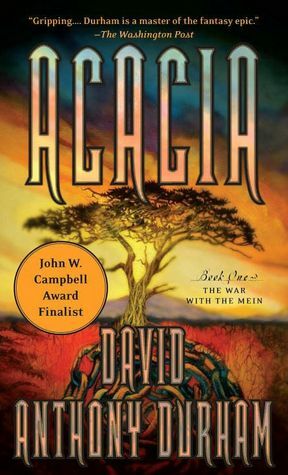 David Anthony Durham’s Acacia Trilogy is the most well-done, best thought-out series I’ve yet read. He started a trilogy and ended as a trilogy. Questions asked in the first book were answered in the second; any new questions that arose in book two (The Other Lands) were answered by the story’s conclusion in The Sacred Band. The world-building was spot-on and the character development was fascinating. Don’t get me wrong; I still love Martin and am enthralled by the scope of his world. But it was a wonderful thrill to spend three weeks immersed in a world that was both fully realised and quickly resolved with elegant story themes. If you are at all interested in Fantasy or Historical Fiction I urge you to dip into Durham’s work. I’m about a third of the way into the first volume right now. My opinion of it varies from chapter to chapter — some of them seem so well done, and others seem more like whatever the prose version of ham acting is. I’m not sure why. Is Durham suddenly a thing, or did we coincidentally just pick up on the series? Well, book 3 just came out so the first one was free on Kindle. And I imagine that we both see a lot of the same book press and picked up on the ads thrown into the zeitgeist in honour of The Sacred Band. I had the most–I don’t want to say “difficulty” or “struggle”–labour getting through Acacia because he clearly was in a very Instructor mode. Thought about giving up a third of the way through because it was SOOOO dense in places. I stuck with it after reading reviews of book two. And about 70% of the way through book 1 it switches slowly from explaining to entertaining. By book 2 it seriously picks up steam. A lot of folks have likened Acacia (book 1) to the classes you take before going scuba diving. A little harsh–but I get it. And it does pay off. Pardon the brevity and the typos. This was sent from my iPhone. Hmmm. That might be what’s bothering me; I’m not sure. I’ll stick with it, because the outline of the series one can sort of see approaching seems riveting, and the alternatives in epic fantasy to bad approximations of medieval Europe are few and far between. Mr. Durham, if you’re checking back here, I can’t (yet) praise you the way Coble does, but if you knew how little epic fantasy I bother to pick up, and how little of that I stick with after the first couple of chapters, you would understand that I criticize because I love, at least prospectively. Last fantasy that I read/enjoyed was Joe Abercrombie’s “Heroes”. Your recommendation sounds good. Is it really that solid or is Durham the “Flavor or the Month”? What other novels are they similar to? Well, Durham was sorta FotM 3 or 4 years ago ( before I was back on the fantasy bus) but he’s been eclipsed of late by Rothfuss & some others. Durham’s “main” genre is Historical Fiction so a lot of Fantasy fans were turned off the series after Acacia. Of the three books, Acacia (book one) is the most uphill to get through. I read a lot of history and a lot of Harry Turtledove’s althistories so I enjoyed it. But what I enjoy (a lot of historical and anthropological detail) is a turn off for a lot of Fantasy fans so the love hasn’t been there for Durham. He’s said in recent interviews that he thinks he’s done writing in the genre for awhile; going back to history I think. It’s a shame because as the trilogy picks up steam it snowballs into epic climactic battles. I haven’t experienced a lot of Fantasy over the years, but I’d say these remind me of what the Chron of Narnia would be like if Pressfield or Bernard Cornwell wrote them. Oh, another reason they lost some punch (from what I can tell on various fora) is that Durham is black and the world he writes “is too black”–quoting one idiot on a forum. Most fantasies seem to be set in alternative medieval Europe. These are set in an alternative African kingdom that actually reminded me (oddly) of Eddie Murphy’s character’s homeland in Coming To America. I don’t love these as much as I love Rothfuss for no good reason other than the first person and Kvothe are really engaging on a level above most other things I’ve read. But they’re the best fantasy I’ve read as far as plot cohesiveness. I never felt like he was meandering and stretching. I’ve tried Abercrombie’s Blade Itself and enjoyed it but havent gone into the rest of the series because I needed to step out of darker stuff fir awhile. Thanks for the mention, Katherine! Very glad you enjoyed the series. You’re clearly a terribly insightful reader. (I’m smiling, but I mean it.) Thanks for the kind words, and for sharing them with others. No problem. I’ll tell you a secret. After the mass-market paperback of the third book comes out in January my publisher is going to reissue all three books in a trade paperback set. They had planned to do this for a while, but when we got a lovely blurb from George RR Martin (and Patrick Rothfuss, too) they got even more excited about it. Since we were changing format, I asked them to let me make some edits to the first book. I read through it – especially the first part – making cuts of things I didn’t think were necessary. I’ve never done that with any other book, but when I looked at The War with the Mein from the perspective of a few years later I could see that – to use Katherine’s metaphor – I’d been doing some scuba diving early on as well. I just trimmed it back a bit. I think it will make for a quicker introduction, which I’m glad about as the trade paperbacks will be the books that hang around in years to come. Of course, that doesn’t do you any good now. I’d say this… If you’re a third of the way through you’ve already done the hard work. Stick with it for the payoff! I’m not abandoning epic fantasy by any means! I’m writing a historical novel about the Spartacus rebellion, but that’s because it’s a project I’ve wanted to tackle for awhile. (It will be very different than the tv series, by the way.) I’d never intended to leave historical fiction behind. I like the notion of balancing between the two. I’m also writing for GRRM’s Wild Cards series – more urban fantasy/sf in that case. That’s an ongoing thing. And I’m developing a middle grade fantasy series that’s an entirely different project. I may well come back to Acacia in the future. I may be wrong, but I – and my publisher – think the reach of the Acacia series is growing, not lessening. That includes international markets. (I’m big in Portugal, and doing pretty good in France and other places.) I feel very good about it. It was the bathers! I swear…. Then again, I’ve been on strong medications. Seriously, though, lest I not make it clear enough, this was hands-down my favourite setting for any fantasy novel. Nothing against medieval Europe and jongleurs and D&D and whatnot. But I loved the setting and the politics here. It seemed more Cradle of Civilisation. Reading about cuts to the trade paperback version of Acacia makes me halfway between sad and proud. I _liked_ all the information from Acacia as it enriched the experience overall. Just don’t cut anything (please) with Rialus and his window. That part just struck me as such a perfect introduction to who and what kind of a person he is. Thank you so much for your comments here. I’m glad that I misunderstood the interview I read about you getting out of the genre. I finished the books a few days ago and all of the characters are still with me. I love them like friends. And I am especially grateful to you for allowing a certain citrusy-scented secondary character to survive.